Jazzy, sharp and snazzy. With a name like the Spotlight Collection, there's no wonder why these wine gift bags are among our most popular. 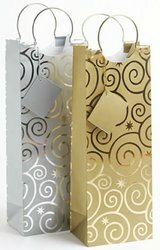 Foil-embossed with metal handles and matching gift cards, this high-quality, thick craft paper assortment features a spiral-and-star design on silver and gold backgrounds.